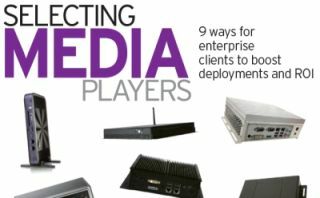 Does it really matter which PC/media player (PC/MP) you choose for your digital signage project? Aren't they just commodity products, easily procured from Best Buy, Amazon or a distributor? I learned this is not true from working closely with PC engineers and designers, with enterprise client teams responsible for PC/MP selection, and from enterprise projects in digital signage, customer engagement and self-service. By working on their projects, clients have taught me how to address their needs, preferences and decision-making process. I observed nine factors for making PC/MP decisions. These factors can be summarized into three categories: market, finance and technology. The first requirement for PC/MP selection is content target. How will the content be generated, distributed and updated? Will you use Flash, streaming video, HTML or another format? Will the content target, methodologies and tools change in three to five years? To future-proof their investment, enterprise clients often plan their content for up to five years. When effectively planned, marketing teams have the freedom to create successful campaigns. ROI is improved the longer the hardware can go without a refresh or update. The best decisions are made when both software and content teams are involved with limit testing on multiple PC/MP platforms. For deployment cycles of three to five years, the best way to future proof they system is to limit the use of hardware to 30 to 40 percent. For example, in 2011, I worked with a top 10 global brand project that limit tested seven platforms. The client invested the time to analyze various content types and distribution/play software components. Measuring resource utilization results across platforms and software/content enabled the client to make a wise and confident decision for a balanced PC/MP selection to support their content needs over time. “This is the single most significant and consistent problem we encounter with respect to hardware selection,” said a professional with 20 years of IT hardware experience. Half of his experience was spent as a senior hardware specialist for a top 10 content management software firm. Confident decisions come from a solid understanding and agreement of target content, combined with PC/MP technology features and options, for today and tomorrow. Make definitive decisions about the strategic locations of your screens. Screen placement is primarily a function of advertising/content delivery effectiveness. If placed with a screen, place it directly behind the screen/video wall with a video cable. If placed far from a screen, rack mount it in an IT closet with signal distribution equipment. Investigate suitability and costs factors (Capex/Opex) for PC/MP location such as content, distance, mounting, environment, service access, regulatory, etc. These factors should shape your PC configuration, design, costs and serviceability. For example, for an eye-level wall screen to be ADA compliant, the screens must be less than four inches from the wall. One size PC/MP doesn’t fit all environments. Placement must consider the environment for air flow, heat sources, power quality, air quality, temperature, insulating materials, vibration, shock and more. Answers to these questions should drive PC/MP component selection, thermal system design, power, etc. #4. Decide how much can be spent now and later. The CMO and team want the coolest and sexiest customer experience and brand presentation. The CTO and team want bulletproof hardware that will be easy to support and be virtually problem-free. The CFO and team and shareholders want a real, tangible ROI. The CFO’s ROI drives many decisions and tradeoffs for content, software, hardware, installation and service. Every client wants the most efficient price point for any given PC/MP performance and feature set. At the same time, those who save the most time from concept to deployment have set clear targets on project and component costs and investments early in the project. They know how to make quick and wise decisions on tradeoffs to enable swift content and software progress for field trials and deployments. A clear understanding of the total solution, including each project stage, saves time and money. Understanding connectivity needs and desires is a critical component for successful planning for today and potential future options. Start with your needs and desires, not with a PC/MP spec sheet. “[This is] priceless! I wish more in our industry got that. It’s no longer about the fastest or the quietest or the cheapest. A solution is all about fit and balance,” said a 20-year IT hardware professional with experience with a top retail brand, managing in-store technology deployments. Consider a project that began with a single screen with PC/MP that was deployed in a national roll-out. Midway through the first deployment it was discovered a second ad screen was needed 40 feet away. The software was more than sufficient to run the distant screen, but the hardware wasn’t. Supporting the additional screen would have been a reasonable Capex cost upfront but became an unreasonable Capex/Opex cost later. What type of signals (analog, digital)? Do video cables need to be physically secured in place/tied down? Will you add displays later? Which model(s) of video panel/display have been selected or are under evaluation? When will the panel need to be upgraded (and how long is it available)? What native resolution is desired for the panel and the content? Will high power be needed (12V)? Will remote connection be supported? What security protocols are necessary (PCI compliance)? Is a remote power/reset switch desired? What is the physical distance PC/MP to screen? Consider graphics: on board, add-on GPU, both? What about a multi-screen video wall/menu board (single large surface multi-screen)? For security, must ports be locked down or physically controlled? Are TV tuner cards or HD capture cards required? Does the project require audience analytics? Figure out your needs and get a PC/MP provider who will meet those needs now and tomorrow. #6. Know your road map. Begin with the end in mind. Enterprise projects that pass prototyping/beta stages can quickly go to scale. Minimizing PC/MP configurations and transitions during scale roll-outs and service improves ROI. Clients have described routine PC/MP changes as “a big obstacle” for deployment and field support teams. Many models increase complexity and require hours for software/hardware validation, cabinetry/bracket changes, disk image/IT security validation and field support for many combinations of PC/MPs, drivers, software, etc. Discuss where the PC design and component road maps are going, and when and what future changes are expected. #7. Know what you’re getting today and tomorrow. Is costly to ROI, Capex and Opex. Consumes labor for coordination, management and follow up. Commercial versus consumer-grade design and components directly impact performance, longevity and price. To keep Opex in line with ROI assumptions, clients plan out remote manageability tools (e.g., Intel vPro/AMT), investigate engineering design and component quality/survivability, and confirm their supplier can both stand behind the solution and affect engineering/fixes for the unexpected challenges that arise. Your project should be built to last, and you need partners to see it through with you. Everyone makes mistakes, but not everyone makes right on their mistakes. Bottom line: Know your product and trust your supplier. #8. Plan your delivery and support model. #9. Ensure the regulatory compliance fits industry and installation parameters. Once deployed and installed, does regulatory compliance still apply for your PC/MP (UL, CSA, FCC, etc.)? I’ve seen a PC/MP that was compliant when flat on a desktop but not when mounted otherwise. The side and top vent holes on the PC were too big for the UL fire safety requirement. This deployment was in a highly regulated market, and the client had invested 14 months of engineering and field-testing prior to realizing that he was out of compliance in certain configurations. He was frustrated over the lost time, added cost and lost revenue that come with a delayed deployment schedule. Your PC/MP partner should provide regulatory compliance for deployment reality. There are a lot of decisions that need to be made when investing in a PC/MP system. Testing is essential if you want to ensure you are getting the right hardware for your needs. The larger the project, the more planning is required, and the earlier the better.